Unlike many of the activities that can be done in space, drawing is a safe space to fail. Field drawing in the heavy space suit on an EVA is tiring though and although nothing is life threatening, it requires stamina and courage in spades to sustain concentration. You know from the start the drawing will never be exactly what you hoped for and you know you will run out of time. The spacesuit and time constraints go together. On today’s EVA Test 2, the idea for this experiment is to see what a scientist can deduce from an observational field sketch without any prior knowledge of the subject drawn. The idea was for me to choose a geological feature at the designated lichen sampling site, draw it while in full simulation and on my return to the hab give the drawing to geologist Jon Clarke. 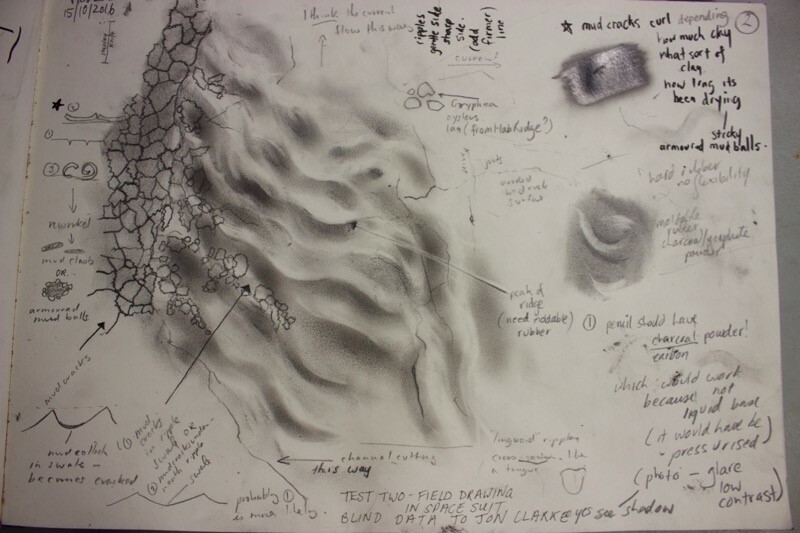 He would interpret and annotate it as a geological field sketch and then we would see how the drawing stood up – how much information Jon could gain from looking at it and whether the key features told him the story of the geology. (modern, though we did find 150 million year old fossilized gryphea oyster shells there, washed down from Hab Ridge). I had about an hour to draw but it took me a while to get comfortable. Even though I had only a basic understanding of what I was drawing I quickly learnt that charcoal powder, for overall tone and a kneadable or electric rubber to highlight the peaks of sand ripples could have been very useful as sand ripples have white highlights, a sharp side and a gentle side. But all this tells me is, as an artist, is I already understand what tools I need to draw different things. It’s unlikely that astronauts on a field trip would use charcoal powder and I’m not suggesting anyone should. Would charcoal powder have to be de-pressurised? After several hours outdoors in thirty degrees and high wind, the sampling of lichens was over. I had been drawing for an hour and could no longer see well because of the glare. We called it quits and went home for lunch. Geologist Jon Clarke immediately identified linguoid ripples in a dry creek bed from my drawing. He also annotated the direction of the current flow and where the channel cut in as well as the jointed mud cracks that indicate an eroded bed rock surface. He explained how mud can crack and curl in ripple swales, depending on what sort of clay it is and how long it’s been drying and he drew another diagram to make his point. (The curls can rework into mud clasts which become armoured mud balls). I think Test 2 was successful as an experiment. Today we established I am able to actually draw features of a particular landscape that a scientist can recognise as indicating some kind of geological narrative, which is a bit of a relief. 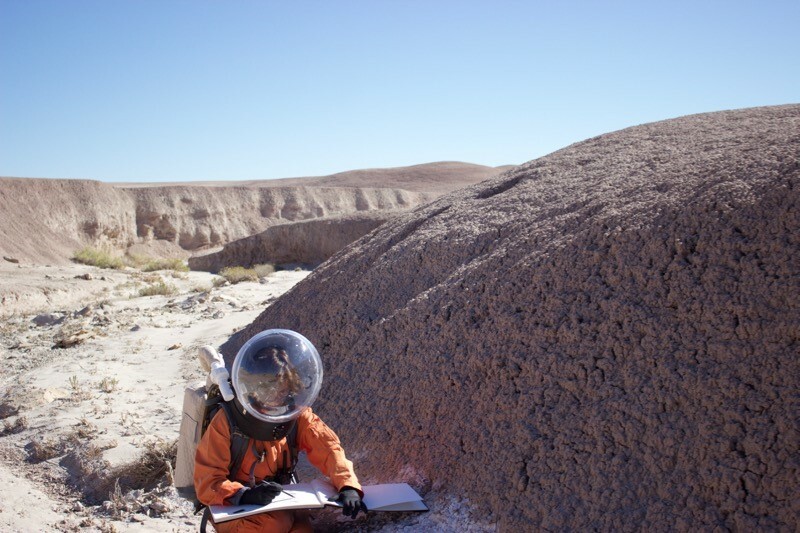 On Test 3 on another EVA, I will again choose a geological feature and both draw and photograph it. Then we will compare images as blind data to try ascertain differences between forms.